The death of Celeste Rochester’s father on the voyage from Jamaica to London leaves her and her young siblings nearly penniless in a foreign country. Forced to battle lawyers for her inheritance and the roof over their heads, Celeste has only one weapon: her mysteriously compelling voice. Having become a barrister to fight injustice, Lord Erran inexplicably incites a riot with his first impassioned speech. Barred from the courtroom, he acts as solicitor for his brother, the Marquess of Ashford. His first job for Ashford requires moving tenants from his brother’s townhouse—a simple task until Erran meets the uncommon beauty living there and realizes she is under attack. Erran cannot heave Celeste’s desperate family from their home, even though his blind brother needs the property. Nor can he sit back and watch unseen enemies do the job for him. Can Celeste trust him to defeat their foe? And if Erran succeeds in saving the lady with the intoxicating voice, can he bear to evict her—when she alone understands the turbulence ruining his life. 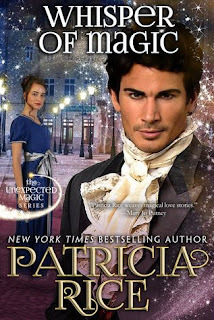 Whisper of Magic by Patricia Rice is a 2016 publication. I was provided a copy of this book in exchange for an honest review. 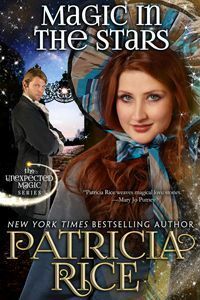 This second book in the ‘Unexpected Magic’ series captured my interest from the start as the author explores a certain magical talent involving the use of one’s voice to persuade or stir emotion. This is a powerful gift that could insight riots or cast a powerful spell over someone, much like mesmerism, and is a very thought provoking topic. As the story begins, Celeste Rochester and her siblings have arrived in England after a fateful voyage from their home in Jamaica, which her father did not survive. Now her lands and future is in question until she can locate a legitimate copy of her father’s will. Lord Erran is trying to have the Rochester family removed from the townhouse they are renting, so his brother can move in. As an attorney, he decides to step in and help the family, hoping to have them out of his hair as quickly as possible. But the beautiful Celeste appears to have talent similar to his, although he attempts to control his voice and its power, Celeste uses her spellbinding voice in a magical, persuasive manner, but with mixed results. Regardless, of their differences Lord Erran and Celeste make a great team, but their differences and forces working against them could drive them apart. I have a feeling this series is going to become one of my favorites. Whimsical, magical, and fantastical! What a fun and adventurous story this is. Celeste is a most unusual woman and her background is steeped in wealth and history, but she is a woman on her own for the first time and is finding her way towards independence and the life that she is meant to have. I loved watching her blossom, and wind Lord Erran around her finger at the same time. Lord Erran is a pragmatist to the nth degree and his attitude towards women set my teeth on edge, although, but at the same time he was extremely comical because he couldn’t see himself falling hopelessly in love with Celeste. This book has a little bit of everything in it for romance lovers of all stripes. Action, adventure, paranormal elements, suspense, intrigue, humor, and passion. The story is unique and I felt myself falling under its spell after only a few chapters. I was totally…. Mesmerized! A fun and vastly entertaining read! With several million books in print and New York Times and USA Today's bestseller lists under her belt, former CPA Patricia Rice writes emotionally-charged contemporary and historical romances which have won numerous awards, including the RT Book Reviews Reviewers Choice and Career Achievement Awards. Her books have also been honored as Romance Writers of America RITA® finalists in the historical, regency and contemporary categories. A firm believer in happily-ever-after for good reason, Patricia Rice is married to her high school sweetheart and has two children. A native of Kentucky and New York, a past resident of North Carolina and Missouri, she currently resides in Southern California, and now does accounting only for herself. She is a member of Romance Writers of America, the Authors Guild, and Novelists, Inc.
Waking Eden by Rhenna Morgan- Cover Reveal!